When it comes to selecting the perfect designer rug, it’s easy to become distracted by colour and design and forget the importance of rug sizing. An incorrectly sized rug can completely throw a room off-balance, however complimentary the style. Opinions differ as to the exact rules of rug placement, so it is important to consider which most apply the characteristics of a particular room; it’s shape, size and configuration of furniture. Different sizes can impact a room in ways you may not expect, so finding a way to visualise a rug before committing is a definitive benefit. An easy way to do this is to mark out the desired area with masking tape or newspaper. Another option is to try some rugs in situ. This is a service we provide to clients local to Bazaar Velvet. Please contact us to find out more. Generally, the most common mistake homeowners make is to buy a rug that is too small for a space. Interior designer Julia Green of Greenhouse design says ‘A generous-sized rug will give the perception that your space is actually larger than what it is. Your eyes are always drawn out to the edge of rugs so if you want to work with the optical illusion of creating a more generous room, GO BIG.’ We believe nothing makes a home more inviting, comfortable and luxurious than large expanses of rug. Our rug size guide will provide you with expert rug decorating tips to help you find the perfect size of rug for every room. 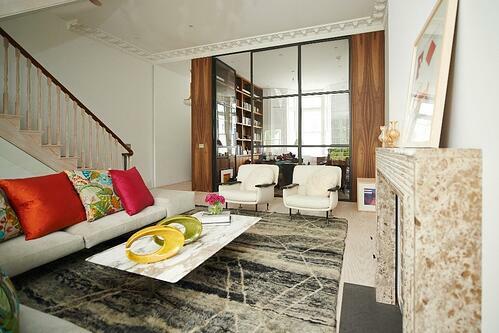 For a living room, there three main options when it comes to rug placement. Although there are no right or wrong answers, keep in mind that the overall aim is to create a framed effect. A rug can be used to unite or separate areas of the room, create pathways and provide softness underfoot where you need it most. If you’re limited by a small room or few suitable stock sizes, this is an option you may consider. 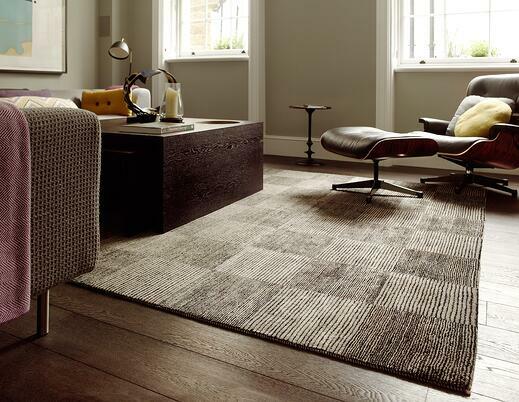 However, be cautious with this, as you risk buying a rug that is too little and can become lost in the space. Interior Designer Rebecca Wakefield says ‘a rug covering only the floor around a coffee table will make the space feel incohesive.’ This is because it can make the centre of the room appear isolated. However, bring the rug all the way up to the legs of the furniture and this option can work. The crucial factor to consider is that peoples feet rest on the rug when seated on the sofa or chair. Most Interior designers would agree the half-on half-off look is the most failsafe option when placing a living room rug. 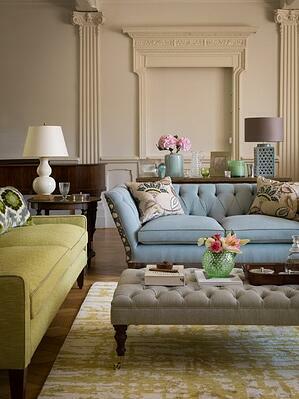 This is the preferred choice for the majority of our clients as it draws together the separate elements of the room. Having these two pieces of furnishing ‘join’ helps the space flow and works for most sizes of room. Adding a large rug to an expansive room is the perfect way to make the space more inviting. It absorbs sound and warmth, breaking up vast areas of bare floor space. For rooms where furniture sits away from the walls, letting the rug flow out from behind the furniture is the ultimate luxury. If space allows, separate the seating area from the rest of the room by leaving a bare walkway behind the furnishing. This will help direct foot traffic around the room. Roger Oats of Roger Oats design notes the growing trend for more room filling designer rugs; ‘We’re being asked to make much larger rugs that cover more of the floor area, rather than just creating an island under a coffee table or in front of a sofa. These rugs are almost like carpeting, but offer the flexibility of being taken up for a seasonal change.’ A bigger rug can have many benefits, so if you have room of large proportions take advantage of it. 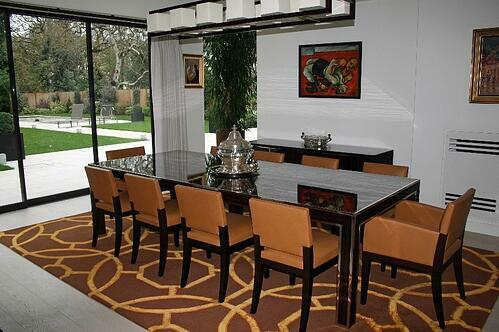 The dining room is arguably the place you most want to avoid making a rug sizing mistake. Underestimating your dimensions can leave you with the irritating problem of constantly catching chairs on the edge of the rug. Measure carefully and choose a generous sized rug that will allow the dining room chairs to be comfortably tucked and untucked from the table whilst remaining completely on the rug. Depending on the size of your chairs, a good rule is to leave a minimum of 50 cm between the table top edge and the edge of the rug. Regarding standard sizes, for a small six-person table, a 300x240 rug may be a possibility, but generally a 270x360 plus would be a more preferable option. If you have a huge dining room, extending the rug almost to the walls will give an opulent effect which is sure to impress. For the bedroom, a common solution is to place the rug almost up to the headboard wall or just in front of the bedside tables. Measure from here to a point at least 30cm from the end of the bed, and at least 60cm around the side. 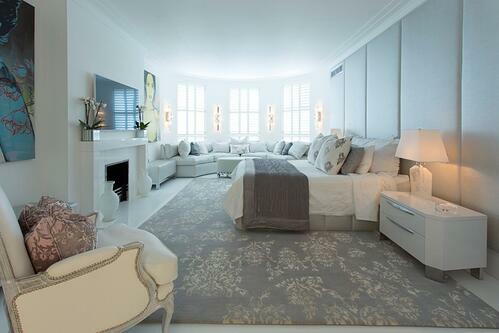 The rug should neatly frame the room, so extend as far out as looks pleasing to the eye. If you’re looking for a designer rug from stock for a Queen-Sized bed, try a 240x170 or 300x240 rug. Or if you have a King-Sized bed, try a 300x240 or360x270 rug. Although this is perhaps a more complicated choice than option one, this is the most cost-effective way of placing rugs in your space, as no square-meterage is lost underneath the bed. Measure from just in front of the bedside cabinets to just before the end of the bed, to create a soft walkway either side. You may choose to have another runner or small rug at the end of the bed too. Runners are likely to have to be made to order as stock sizes are very limited. There is also a third option, which many never consider. This is to have a U-shaped rug made to order to fit exactly around the edge of your bed. At Bazaar Velvet, this is something we’ve been requested to make in the past and our clients have been very happy with the result. In recent years, there has been a noticeable decline in rug retailers holding stock pieces, despite many clients preferring to purchase a finished rug. However, a handful of respected companies will keep a range standard sizes readily available. Each have their favourites, but standard sizes are generally universal depending on the rugs origin. Not many UK retailers stock pieces beyond 420x300 (or even 360x270), but at Bazaar Velvet we provide a rug finder service for oversized pieces. Also, if you require a square, round or long and thin size, please feel free to enquire, but be aware this will rarely be available from stock. This would be better served by a bespoke service. Make an enquiry now to find out what stock pieces we have on offer to suit your requirements. Many of the Bazaar Velvet collections can be made to order in any bespoke size with no added premium. Time frames vary mainly according to the rugs construction and place of origin. For example, Bazaar Velvet lead times can be as little as 3 weeks for a patchwork rug, but a traditionally made hand knotted rug can take anything from 4-9 months to be made. However, this is definitely to be recommended if you have an awkwardly shaped space that requires a rug of exact dimensions. A perfectly sized rug is well worth the wait. 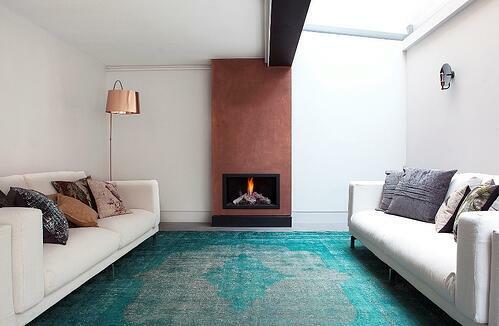 Read our helpful guide to find out more about the bespoke rug design process at Bazaar Velvet. We hope you found this rug size guide useful, and enjoying you journey to discover your perfect designer rug. For more helpful rug decorating tips, read our blogs listed below. For more advice, please feel free to contact us.